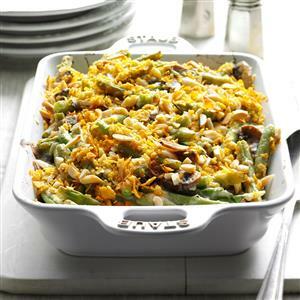 Try this green bean casserole this year, and you'll never go back to the old stuff. Place beans in a Dutch oven and cover with water; bring to a boil. Cover and cook for 3-5 minutes or until crisp-tender; drain and set aside. Preheat oven to 400Â°. In a large skillet, saute mushrooms in butter until tender. Stir in flour, onion and pepper until blended. Gradually stir in milk. Bring to a boil; cook and stir 1-2 minutes or until thickened. Remove from heat; stir in sour cream and Worcestershire sauce. Stir in beans and cheese until blended. Transfer to an 11x7-in. baking dish coated with cooking spray (dish will be full). Combine topping ingredients; sprinkle over the top. Bake, uncovered, 12-16 minutes or until bubbly and heated through. Yield: 12 servings.